MUFF WIGGLER :: View topic - Birdkids ”Raven” ? Anyone with any sort of info or rumour about this module ? This looks pretty cool, if it comes out. I love my Bateleur system and their other designs look awesome but I'm really disappointed that nothing they show at trade shows is ever actually released. Looks cool. They make good stuff. Synthesis can make the world a better place. They clearly need to eliminate the the patch-cabling paradigm which is already a very male view of the world..
i have the bateleur... and i'm trying to figure out what's so special about the Raven? what's so special about the Raven? looking at it in more detail, i think what separates it from the Bateleur and also competing semi-modulars (Mother 32), is that it has two voices that can function independently. How exactly is it overpriced, Felix? Dear j_dowe, we're not really trying to compete with mass marketed (within the segment that is) semi-modular solutions. 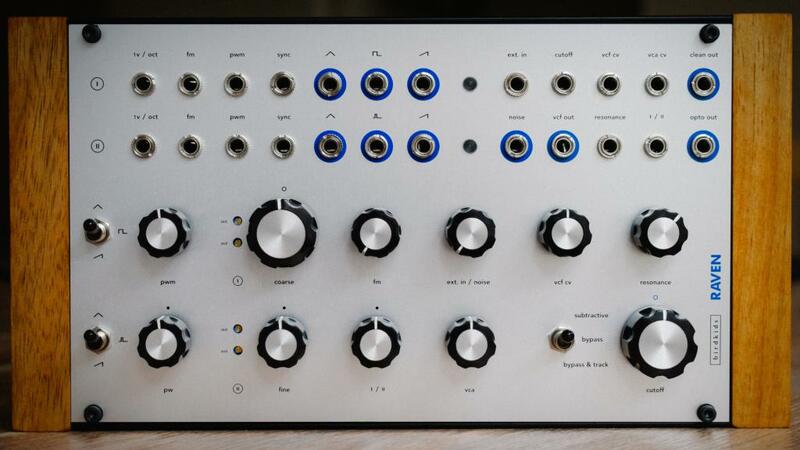 Influx of budget-line solutions that flooded the market recently brought with it not only potential good, such as young talent that can finally afford getting into modular, but also false expectations regarding pricing threshold. As a small, don’t-call-it-boutique manufacturer, we cannot, nor try to compete in that price range. Our batches usually run between 50-100 pieces for such a production set. Instead we opt for quality in both build and sound. Track record and clientele clearly shows where we’re positioned over the years, however it’s not a reason to be snobby about it, hence we thought this campaign would be a fair proposal to lower the mutual cost. Clean Out (Linear THAT2162 BlackmerⓇ VCA). Opto Out (Optocoupler VCA, West-Coast style response). It looks very simple on the surface, but once you dive in, the possibilities go far beyond the expected two VCO configuration. Hey Felix, and first of all I did not mean to sound sharp or anything, it's just that for the last 3-days since we've launched, the first feedback, before people even clicked on the campaign link and I imagine checked out the concept/sound behind it, would be smth. like "I can buy three Uli boxes and fly around the world for that price" reaction. I'll be honest I'm ticked off by now, so forgive my directness. We've spent over 10k+ hours designing and perfecting this one here, and naturally being thrown into the budget-line, clone-a-park and derivatives of Bob Moog's legendary design is not something that we find thrilling. Seeing as our clients (and you were there in the very very beginning, which is something that we cannot be more grateful for) know what we're about and what we're able to deliver sound and build-wise usually plays in the 2k+ range. I don’t really understand why this is seen as expensive? I mean, in Euroland you would easily pay £150+ for each one of those VCO’s, and another £150 for the VCF and the VCA. 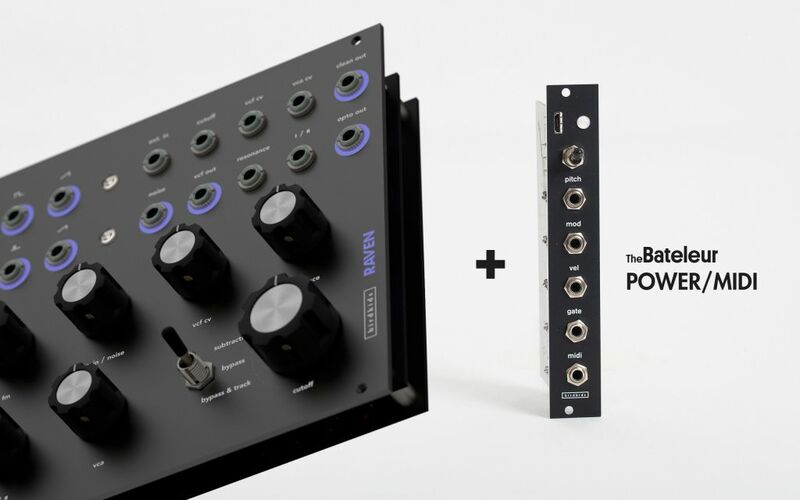 That’s £600 – pretty much bang on the retail price – for just pretty much run-of-the-mill modules. If Birdkids have really made something as high quality as they suggest, then you could easily add another £50 or £100 to each one of those prices, which would make this pretty competitive. And that's precisely how we, and our distribution network sees it, also the fact that we're offering it over 50% Off MSRP, bypassing distribution (who have full support for this) and retail just to be able to give people who deserve, but cannot afford the MSRP tag a chance at quality. Make it sound amazing, make it an instrument. Design it so that it can be used intuitively. Design it as accessible and inclusive as possible. Make it as affordable as possible without compromising the above points. May i ask what the case and power solution i for a raven? As in does it come in a case with power? as with any module, we've found that most people prefer to have their own casing and it's very hard to predict in which context it will be used. Additionally to that, seeing as we've added CV possibilities at (almost) every point in the design, we're expecting to see a lot of integration into racks as opposed to simply standalone. absolutely understandable and you've proved your point. I think this looks and sounds amazing, strongly considering getting on board, I really hope this gets funded. ... also the fact that we're offering it over 50% Off MSRP, bypassing distribution (who have full support for this) and retail just to be able to give people who deserve, but cannot afford the MSRP tag a chance at quality. much respect for the above. Instant pre-order for me. Terrific Sound AND such high end product is insane for this price. It would interesting to know what the developers see as accessible and intuitive regarding the design. At a 40% early adopters price it is something I would consider but as with the bateleur having the filter included stopped me from buying one. (not a shot at the filter, I just have too many of them). Getting to try out and demo the raven, it really sounds amazing, also as an owner of the bataleur, i must say, it sounds quiet different, even more expressive and musical, it has his own character (crunchy organic sounding) compared to other high end dual oscillators i played with, really worth it. S P A C E to breath. Clear flow of functionality, read like a book - know by heart after repeated use. With TheBateleur, it's not just about the VCO(s), it's about the combination, there is a deep concept behind the components playing together, definitely not a mix'n'match concept - as for the modifiers, that's always fair game Of course same goes for RAVEN, different concept, different combinations of components. The general idea is always, if the essentials sound good, there is in principle no need to *uck with too many outside parameters, if a sound needs 3 layers of additional stuff on top and 2 lfos to come alive, it's not good to begin with and never will be. i would love to hear more on how it's different sounding from the bateleur? i like the bateleur, but trying to figure out if i'd like this even better. i probably can't afford to own both ($$ & hp), but i could potentially sell the bateleur+expansion to fund a raven.